Corvus graculinus Shaw, 1790, Port Jackson (Sydney), Australia. 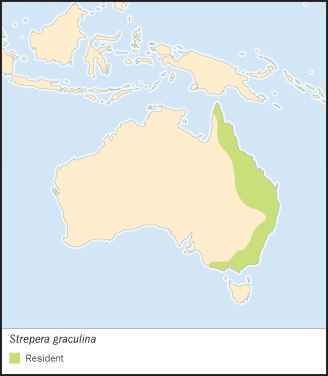 Three to six subspecies in eastern Australia: one large-billed on eastern Cape York Peninsula (Strepera graculina magnirostris), one all-dusky in western Victoria (S. g. ashbyi), and the others between which vary regionally in size and tone. One further slender-billed subspecies occurs on Lord Howe Island (S. g. crissalis). English: Black currawong; French: Grand Réveilleur; German: Dickschnabel-Wurgerkrahe; Spanish: Currawong Palido. 17-20 in (43-50 cm); 10-12.5 oz (280-360 g). Slender, dusky, crow-like birds with hidden white flashes in wings; white tips on long tails; and broad, white bands at base of upper- and un-dersurface of tail and undertail coverts. Eyes pale yellow and bills and feet black. Females resemble males except for shorter bills; juveniles duller and grayer, with brown eyes and yellow gapes and mouths. Coastal and subcoastal eastern mainland Australia between Cape York Peninsula and western Victoria, with outlier on Lord Howe Island. Closed forests (including rainforests and wet eucalypt forests) to denser, taller wetter woodlands of euclaypts; also urban gardens and parks where tree cover is ample. Cool montane forests and woodlands of eucalypts are core habitat. Skulking, opportunistic, and piratical predators. Territorial during breeding, pied currawongs congregate in loose foraging flocks of up to a hundred or so at other times; southeast populations move out of mountain ranges to lower altitudes and more northerly regions in early autumn (late March to early April) and return in early spring (September) to breed. Foraging flocks work through all strata of their habitat, running over the ground, bounding about foliage, and flying from tree to tree in slow, loping undulations broken by floppy wing beats. They call constantly to maintain contact or advertise territory with loud whining whistles and clanking glottal chortles. They do not sing or carol like other Australian magpie-shrikes but do call loudly to one another when gathering to roost in tall trees at dusk. Omnivorous scavengers that search for food anywhere, bounding about shrubbery and branches; poking into foliage and crevices; or walking, running, and hopping over the ground to peck, probe, and jab. Rubbish tips and camping grounds with food waste are favored. Carrion, small birds, nestlings, insects, caterpillars, lizards, snails, food scraps, and berries are all eaten. Over the last 20-30 years, berry-bearing ornamental trees have attracted currawongs to many urban habitats on the east Australian coast, where the birds remain year-round and cause havoc among other bird species during breeding. Strictly monogamous and territorial. Pairs establish territory of some 12-37 acres (5-15 ha) early in spring (September, or as early as July in the far north) and build from late September to mid-October, so that young fledge from mid-November into December; only one brood reared per year. Although males may assist in gathering nest material and in feeding older young, females bear the brunt of nest construction, incubation, and the brooding and feeding of young. 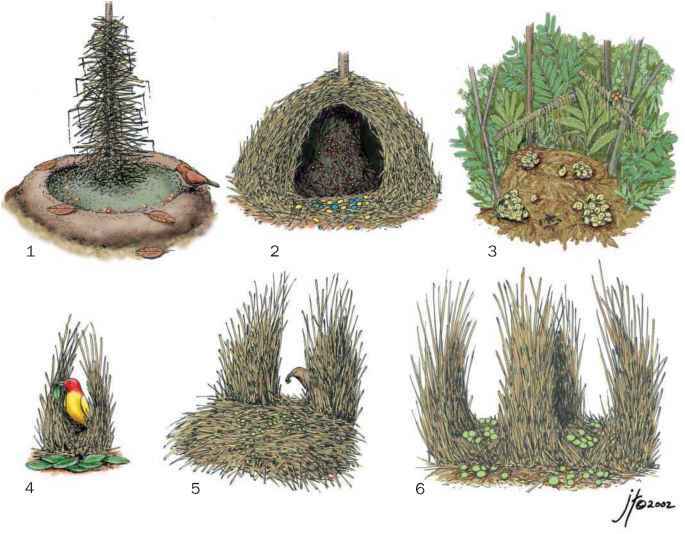 Nests are rough and rather flimsy bowls of twigs, lined with finer fiber and placed high in the outer branchlets of tall trees at about 40-65 ft (12-20 m) above the ground. Eggs, two or usually three per clutch, are 1.58-1.69 x 1.10-1.25 in (40-43 x 28-32 mm) and pinkish buff finely specked and spotted with dark brown and dusky. They hatch in 20-22 days, and young fledge in about another 30. Not threatened. Because of their predatorial behavior, pied currawongs pose a serious threat themselves to the nesting of many species of Australian birds in human-modified areas.